This October, we’re electing 8 Campus Executive Officers and 2 NUS delegates. Voting for these is really important, because Campus Executive Officers campaign for issues you care about and work closely with the President/Vice-Presidents to make changes for students. NUS delegates represent UCA on a national level at NUS National Conference. Nominations open at 10am on Monday 9th October and close at 3pm on Tuesday 17th October. Voting opens at 10am on Wednesday 18th October and closes at 3pm on Friday 20th October. Results will be announced that evening. What is a Campus Executive Officer? A part-time student officer that represents their campus. There are 8 in total - 2 per campus. What does a Campus Executive Officer do? Campus Executive Officers are champions for their campus! They work with the President and Vice-Presidents on almost every aspect of life on campus, from campaigning to meeting up with clubs and societies’ leaders to running Student Forums. Campus Executive Officers make sure the union knows what’s going on with students and helps to bring different student communities together. How could this role benefit me? Phill, previously a Campus Executive Officer and now UCASU's Vice-President Surrey, says: "Being a Campus Executive gave me a great understanding of how the union runs and helped me develop not only the leadership skills I didn't know I had, but helped my confidence to grow and become the campaigner I am today. It helped me get to where I am today as the VP for Surrey for UCASU." How can I become a Campus Executive Officer? You get elected! To become a Campus Executive Officer, you need to nominate yourself for election between 9th-17th October. Then you campaign for yourself - we have a candidate briefing on Thursday 12th October at 1pm for more information about how to campaign - 18th-20th October and results are announced on 20th October on our website. The October elections are quite lowkey, and if you’ve considered running in the main elections for a full-time officer position, running to be Campus Executive Officer is excellent preparation! To nominate yourself, find the nomination link on our homepage from the 9th of October 2017. What is an NUS delegate? NUS stands for National Union of Students, and UCASU belongs to NUS just like UCA students belong to UCASU. We represent you, and NUS represents you as well as hundreds of other unions. NUS has an annual National Conference where elected students and officers come together to debate policy that will become NUS campaigns in following years. Maybe to some that sounds dull, but what it really means is that you basically get in at the beginning of some massive national campaigns - on issues from free education to free Palestine - and meet students from all over the country at the largest democratic event in Europe. We have 2 NUS delegate positions available and 1 is reserved specifically for a woman student. Tomm, one of UCASU's 2017 NUS delegates (and now President of UCASU! 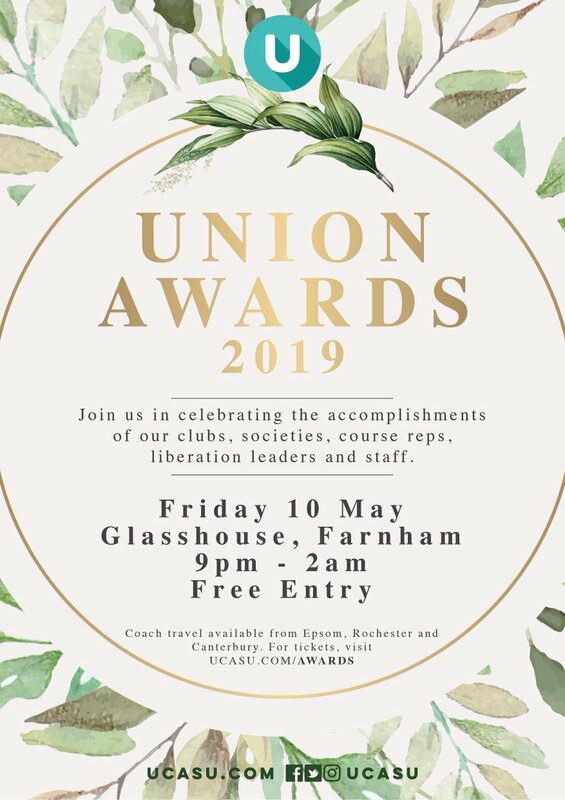 ), says: "Becoming an NUS Delegate for my union gave me the opportunity to see the larger picture, I met hundreds of other Union representatives and had an impactful chance to shape the policy that affects us as students. Being in that conference hall during Europe's largest democratic conference was frankly impressive." How can I become an NUS delegate? Just like being a Campus Executive Officer, you have to be elected! You need to nominate yourself for election between 9th-17th October. Then you campaign for yourself - we have a candidate briefing on Thursday 12th October at 1pm for more information about how to campaign - 18th-20th October and results are announced on 20th October on our website. The October elections are quite lowkey, and if you’ve considered running in the main elections for a full-time officer position, running to be an NUS delegate is excellent preparation! Get in touch with Sophie Jackson (Head of Membership Engagement) by email [email protected] or phone 01227 81 7412 with any further questions!